Heads of Agencies or delegates at ISS Symposium Berlin. 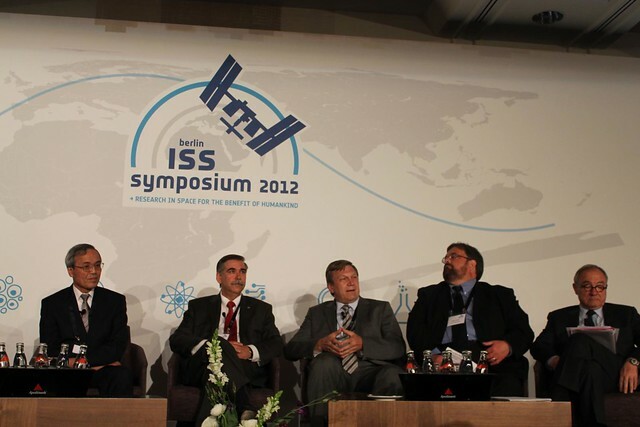 L-R: Kiyoshi Higuchi, Vice President, JAXA; Mark Uhran, ISS Director, NASA; Alexey Krasnov, Director of Human Spaceflight Programme Department, Roscosmos; Gilles Leclerc, Director General, Space Exploration, CSA; Jean-Jacques Dordain, ESA Director General. JAXA Kiyoshi Higuchi: KIBO module experiments paid for by 60% by Japanese government. “With the ISS, we will be able to contribute to solving the issues of humanity and the Earth.” Important to reduce operational costs and increase efficiency. Ensure that humans will be able to explore further. Roscosmos: First impulse was curiosity. Operating such a big structure as the ISS is a great experience. Working with NASA on Mir was like two different universes. Working together on ISS has bought us together. CSA Gilles Leclerc: Mix of research. Faces challenge of proving itself in the short term, whereas projects are long term. Requires courage and vision. ESA: Operations are also a large part of ISS use. Full utilisation only started 2 years ago. Already as mentioned we have lots of health research. Resources on ISS are scarce. Any benefits from work done on ISS in these terms can be directly applied on Earth. I like the present partners but welcome more partners. This entry was posted in Speakers, Symposium programme, Video and tagged comments, opening, roundtable. Bookmark the permalink.